A relationship that began as second graders on the playground, has blossomed into one of the most successful Tucson business startups. TUCSON, Ariz. — A relationship that began as second graders on the playground, has blossomed into one of the most successful Tucson business startups. Tucsonans Jeff Kaiserman and Stephen Ochoa started Frost in 2005, two years after graduating from the University of Arizona. "We had a lot of different ideas," said Kaiserman. "Finally my father suggested we do a gelato shop." "We both had been to Italy," Said Ochoa. "We both have a gelato experience and fell in love with the product." They also booth realized with Tucson's climate, a frozen treat would be a perfect fit. "Being able to create our own niche," recalled Kaiserman." "You know everyone loves ice cream. All we had to do really is educate the consumer and we felt at worse case we'd do alright." They have done better than alright. For a dozen years running, Frost has been named Best of Tucson. That is impressive considering Frost has only been open for hust over 13 years. At the beginning, the best friends and business partners brought in a ringer, Master Gelato Chef Nazario Melchionda from Balogna, Italy. Melchionda was originally brought in for four days to help them launch. That turned into two weeks, then three months. He is still with Frost in Tucson to this day. "Turned into a lifetime," said Kaiserman. "Essentially for him and us." You will still find Nazario making the gelato at the three Tucson area locations. He is the one responsible for the delicious taste. Gelato has far less cream than ice cream, making it more flavorful. "As Nazario says you can have lasagna out of the microwave or you can have it homemade like his mom," said Ochoa. "The way we do it at Frost is really the true authentic way." Frost imports all of the raw ingredients directly from Italy. They do a pasteurization process the old style way. "Then we make everything on-site at each location, in individual batch form," according to Ochoa. "In Italy we used to say that you eat first with your eye," said Master Gelato Chef Melcionda. That is why for Melchionda feels that presentation is so important. 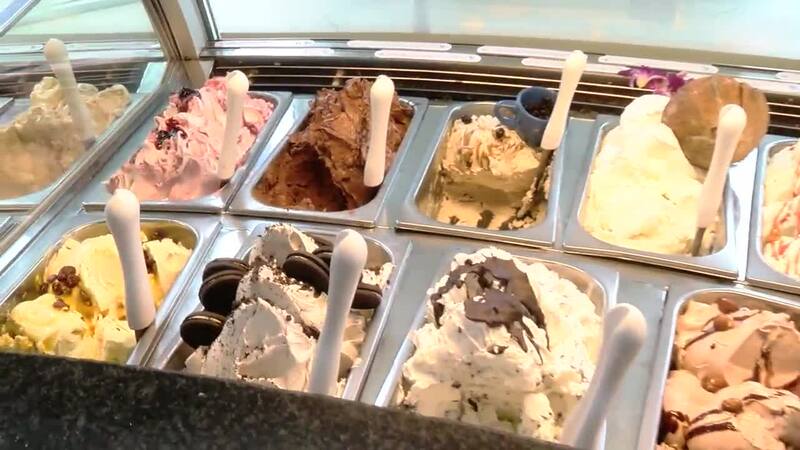 The colors and flavors can be seen in the display case, before you even taste the gelato. The success of Frost's three Tucson locations has allowed for steady growth. They have a pair of locations in Phoenix, with a third planned for Scottsdale. This summer a third California Frost will open. With franchise opportunities, Frost is also in Albuquerque, Austin and Dallas. A location will open soon in Richmond, Virginia. Then there are the multiple franchise locations in the middle east. Yes, a Kuwaiti businessman happened to see the Frost location at La Encantada and wanted to bring it to the middle east. "It was a no brainer for us," said Kaiserman. Success also earned Stephen and Jeff the very first "Emergent Entrepreneurs Award" from the UAs Eller College. But you will still find them almost every day at one of the frost locations. And yes, they still enjoy eating gelato. Stephen's favorite is pineapple and Jeff's is coconut. "Overall our most popular flavor is sea salt caramel and chocolate," said Ochoa. "Typically our two top flavors." Also quickly becoming a favorite flavor is the award winning Nazario creation called Bagigi Peanut. It was recently named one of the best gelatos in the country. Frost continues to grow across the country and around the world. It proves that two second graders from Tucson can one day build a gelato empire.